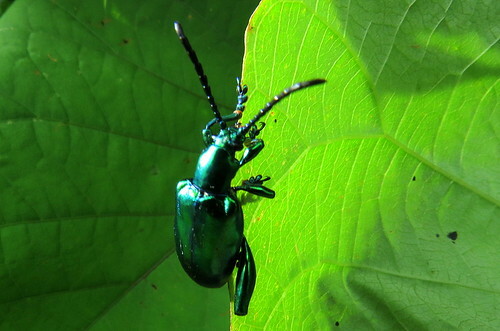 A variety of insects can be observed in the gardens and plants around us. 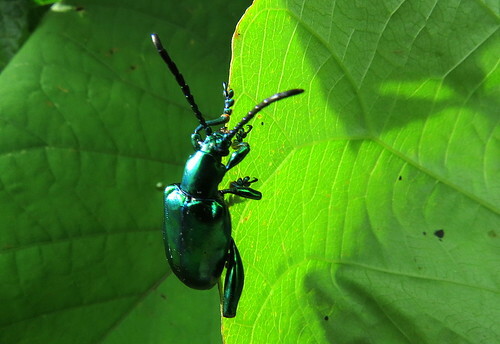 Here are a few six-footers…that is, insects that are quite tiny, and easy to overlook. 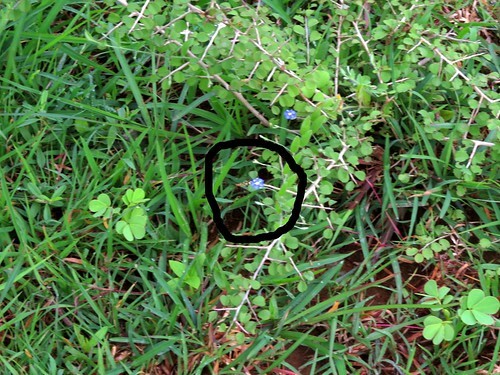 Do look out for them as you walk around…they are all around you, in the city as well as in the rural or forest areas! 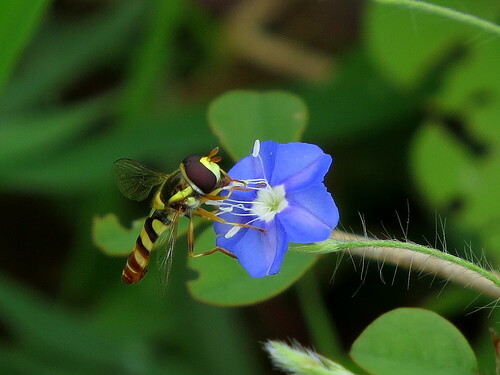 All these insects are busy, pollinating flowers, flying about, and keeping Nature going on her regular cycle. Enjoying them will fill our daily lives with delight! 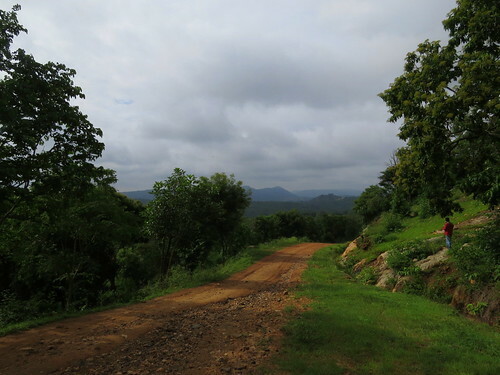 What can be better than a meandering path through the hills, amongst greenery, under monsoon skies? 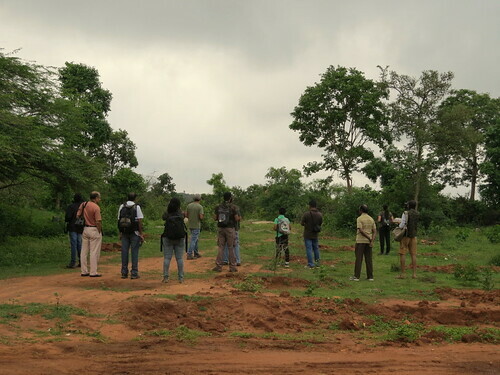 The many beautiful areas of Bannerghatta National Park (this is Jaipurdoddi) are great places to visit. Thank you to Arun Gorur for taking me there, along with his wife Ramya and daughter Amrita. With the sheen of metal? Would I take it for granted? Or…would I be insensible, unaware, of how I looked? 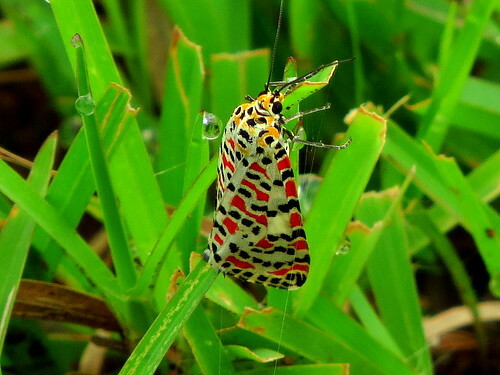 I look at the beauty of this creature, and wonder…. For the past few weeks, I’ve been going to Jaipurdoddi pretty regularly, and since it’s a beautiful place, I decided I’d join the 3rd Sunday outing this month. to get some caffeine into our systems, and introduce ourselves to each other, we proceeded to Jaipurdoddi village. On the way, a Black-winged Kite being mobbed (as usual!) 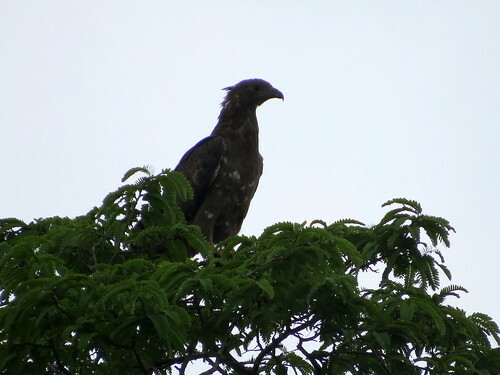 by crows, flew across the road, and it was our “boni” sighting of a raptor. Deepak had asked us to walk along from Balaji Tea Shop (now displayed on Google Maps!) towards the Reserve Forest,and that’s what we did. I quickly realized that many people were as familiar with the place, if not more, than I was. So the group straggled out a bit, initially. had the Binoculars happy, and the Bazookas ruing the lack of light. What brought us together again? 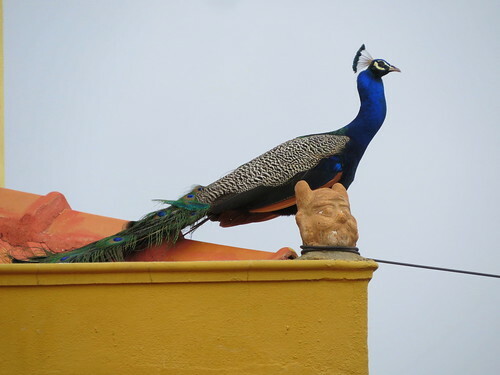 The fact that this seemed to be “Pose For You” day for the birds of Jaipurdoddi! 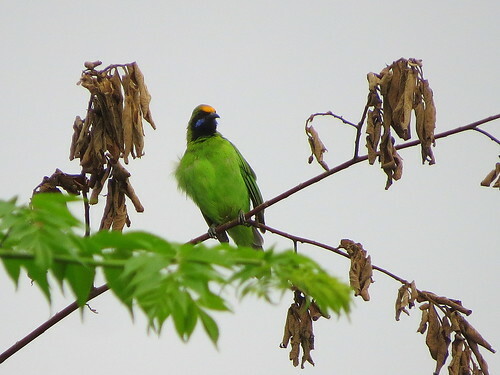 After the sharp sighting of a Golden-fronted Leafbird in the trees, we were delighted when it came right out on a branch, and sat there preening,in the open. Out came the lenses and the binocs, and all of us watched the bird for a while. We walked through the village (where many of the farmers had already left for the morning’s work) and down the road through the fields. The lake itself was so scenic, and looking at several plants (some that I knew about, and plenty which I didn’t) kept me occupied. But the birding pace picked up with the appearance of two Oriental Honey Buzzards, flying right overhead. Robins, some Asian Palm Swifts and a Rufous Treepie kept us from walking too fast. 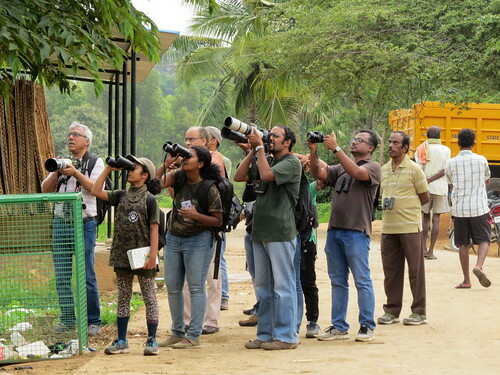 As we all stood near the watchtower, we saw a Scaly-breasted Munia making multiple with the long reeds with which their nests are usually built. To our surprise, the Munia went, each time, into the partially open window of the watchtower itself….nice to think of a house within a house! 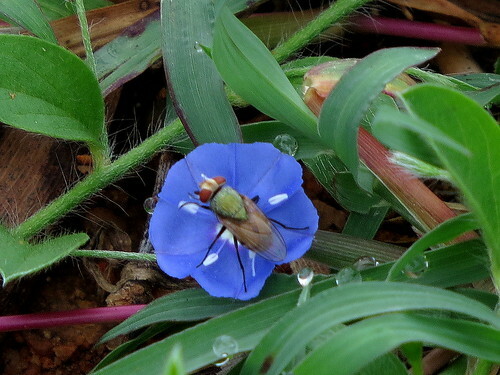 while some of us spotted a beautiful Hoverfly on the tiny Evolvulus flowers, and decided to document that. A Hoopoe showed up very briefly, as did a Yellow-crowned Woodpecker. Of the many woodpeckers I have seen here in the fields (Yellow-crowned,Streak-throated, Brown-headed Pygmy, and the Black-rumped Flameback) this was the only one which showed itself that day. 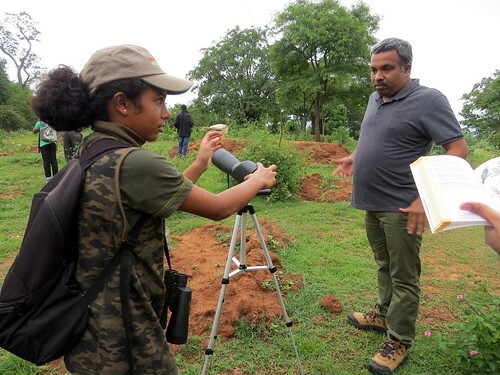 Sriram and his daughter Keertanatrained their scope on it. 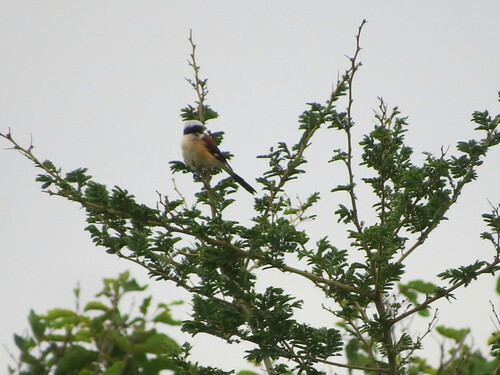 …the latter actually flying to a bush closer to us, and posing for a while!There were other birds, too…further off,but sitting and posing! 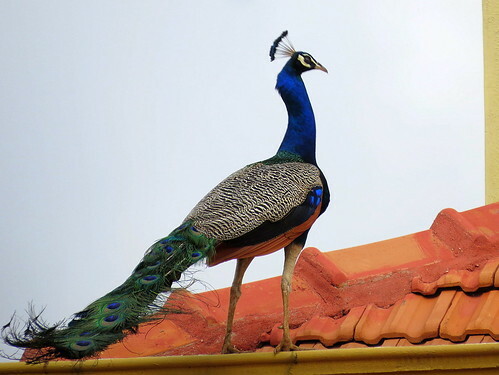 We looked at the iridiscent plumage, and realized, from the strutting of the bird, why the expression “proud as a peacock” must have originated. Many of these peafowl, like their cousins in the outskirts of Delhi, seem very comfortable with human beings. But just then, there was a tiny surprise package. Hardly a few feetfrom us, a little Purple Sunbird, in eclipse plumage, darted amongst the Hibiscus flowers on the wall of the garden, and completely “eclipsed” the peacock! 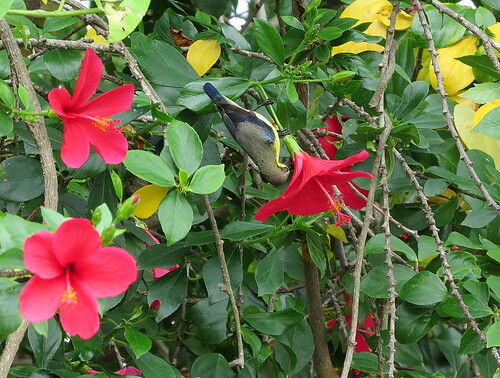 We looked and observed how the bird pierced the base of the flowers for a shortcut to the nectar. as we finished the walk, looking at several butterflies, too. 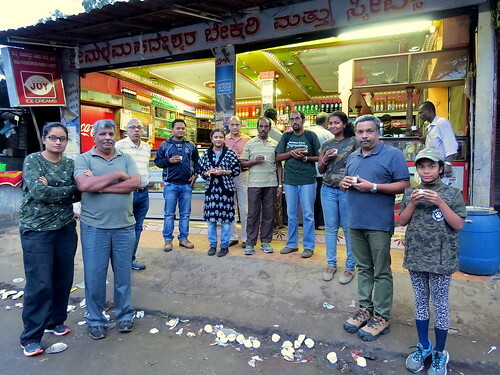 Our group went back to Ragihalli to eat at Manjunath and Suguna’s eatery (which I call Ragihalli Fine Dining), and a few of us decided to visit Harohalli kere as well, and returned home tired but happy. 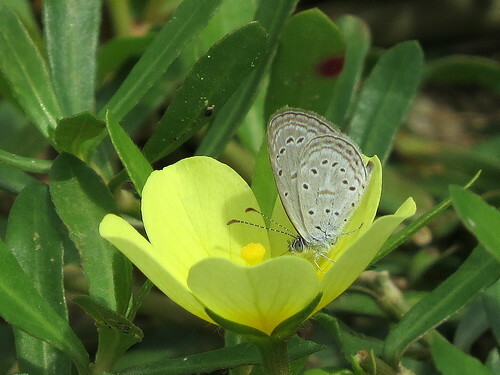 on a tiny Evolvulus flower. Here’s what the scene looked like, without using the zoom on my camera. Can you see it? 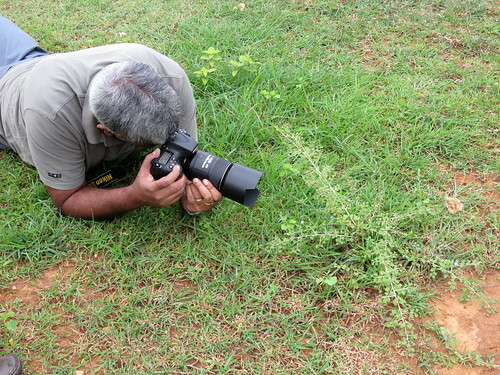 So..photographs may not lie, but photographers certainly do, in the quest for that tiny creature that they can document and share with others! 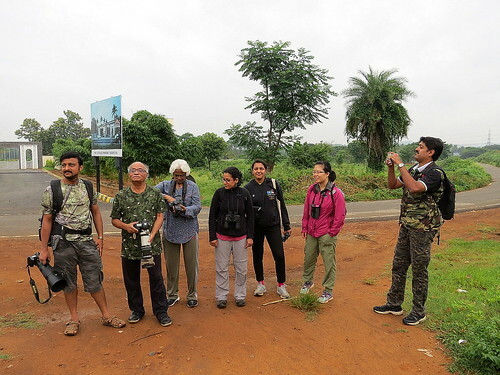 As I led the birding-nature walk for the 3rd Sunday outing, we walked through the village of Jaipurdoddi, adjacent to the Jaipurdoddi Reserve Forest. Walking through such settlements gives me glimpses into lives that are so different from mine…but now and then, there are elements that formed part of my own life, too. 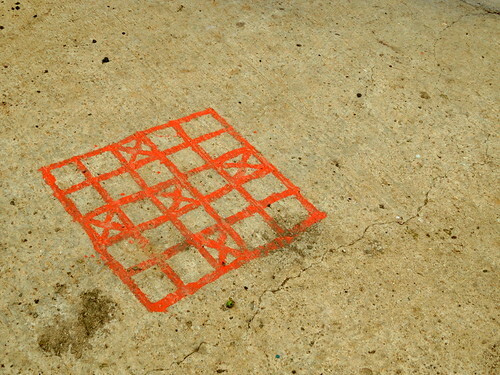 On a concrete path, I saw this design painted. Girish added a more complicated version of the game:”We use to call chukka, bhara (something might be derived from hindi six and twelve). “You can kill the coins. But there is an additional inside square where you can make a pair of your own coins. When you first pair them together, then they are called ToLLU. When you get “2”, you can move both of them together and then they become gaTTi. “When it is toLLu, anybody kill one of the coins if they land on the same spot. And if they happen to get ‘1’ in the extra turn, second coin also go home. “But, when it becomes gaTTi, the others can not cross or kill with single coin. They also need a pair of gaTTi to kill this pair. “If somebody wants to cross, they have to spend a night (one turn) in the spot along with the pair. During this if the pair makes one move, the single coin(s) of others will go home. “This used to be to block others from crossing and comes with pros and cons. The major con is, once it becomes gaTTi, it can not be broken into single again. Since its a pair, you always need even number to move. Anurag and Girish, enjoyed the game without even playing it! Aravind, I’m glad you enjoyed this game, too. are beautiful birds to watch, especially during breeding season, when they build beautiful nests. Baya weavers are social and gregarious birds. They forage in flocks for seeds, both on the plants and on the ground. Flocks fly in close formations, often performing complicated manoeuvres. 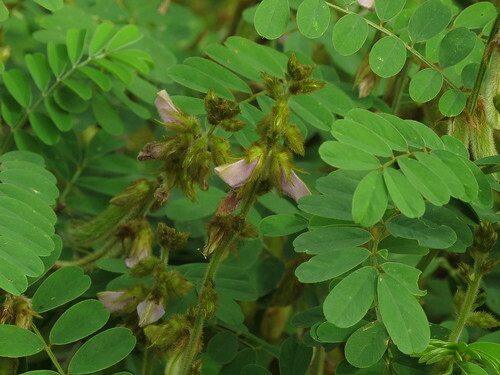 They are known to glean paddy and other grain in harvested fields, and occasionally damage ripening crops and are therefore sometimes considered as pests. They roost in reed-beds bordering waterbodies. 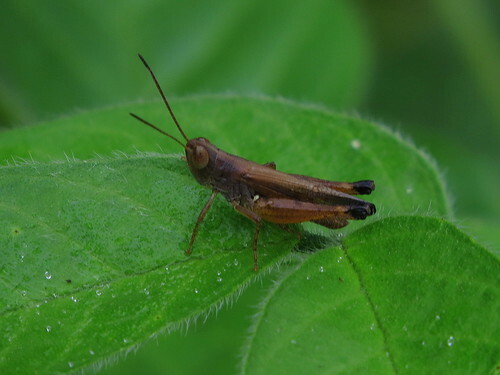 They depend on wild grasses such as Guinea grass (Panicum maximum) as well as crops like rice for both their food (feeding on seedlings in the germination stage as well as on early stages of grain) and nesting material. 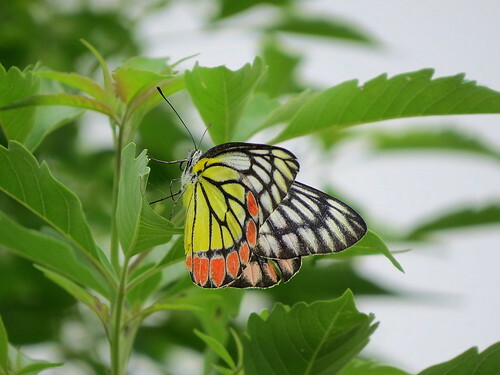 They also feed on insects (including butterflies), sometimes taking small frogs, geckos and molluscs, especially to feed their young. 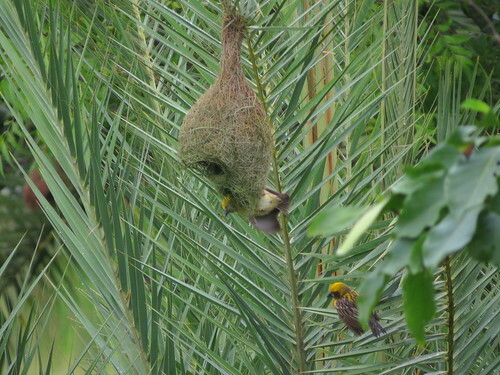 The breeding season of the baya weavers is during the monsoon.They nest in colonies typically of up to 20-30, close to the source of food, nesting material and water. 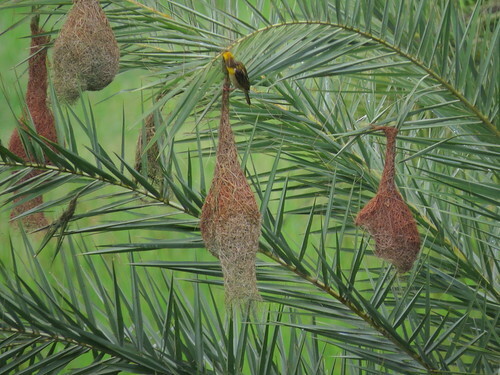 Baya weavers are best known for the elaborately woven nests constructed by the males. The males take about 18 days to construct the complete nest with the intermediate “helmet stage” taking about 8 days. 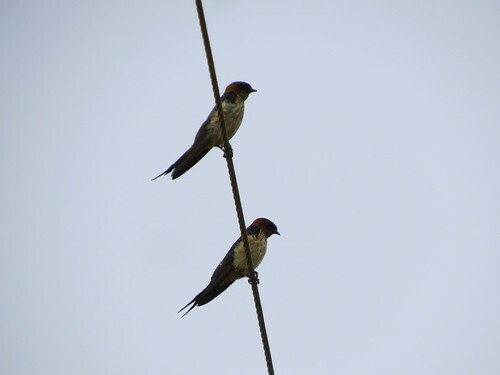 The nests are partially built before the males begin to display to passing females by flapping their wings and calling while hanging from their nests. The females inspect the nest and signal their acceptance of a male. Once a male and a female are paired, the male goes on to complete the nest by adding the entrance tunnel. Males are almost solely in charge of nest building, though their female partners may join in giving the finishing touches, particularly on the interiors. Females may modify the interiors or add blobs of mud. 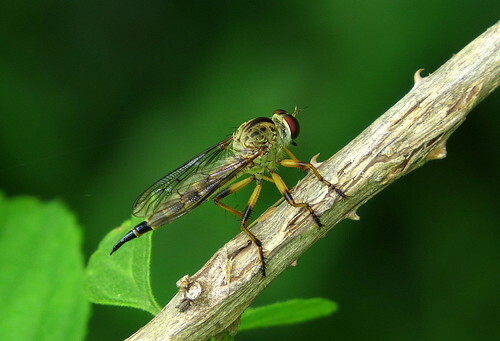 Both males and females are polygamous. 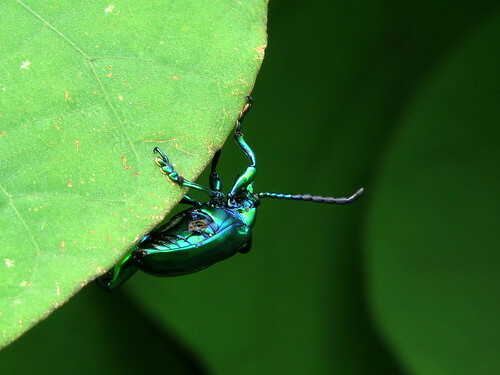 Males build many partial nests and begin courting females. 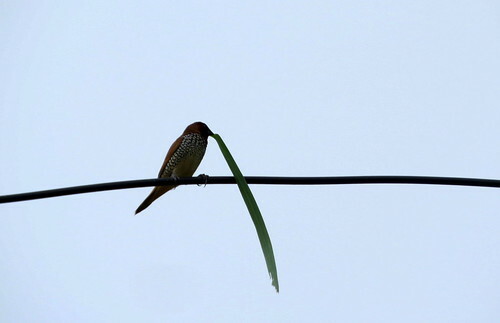 The male finishes the nest only after finding a mate. These birds have also entered local folklore and culture. A widespread folk belief in India is that the baya sticks fireflies with mud to the nest walls to light up the interior of the nest at night! 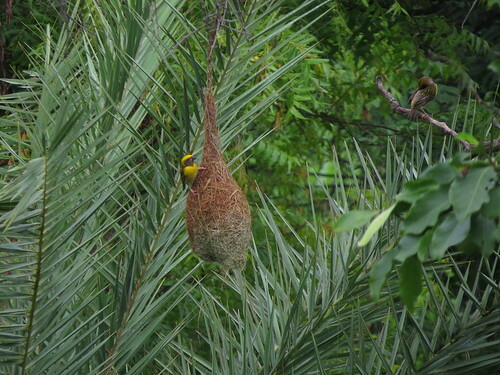 In earlier times, the baya weaver was trained by street performers in India for entertainment. They could pick up objects at the command of their trainers. They were trained to fire toy cannons, string beads, pick up coins and other objects. These uses have been noted from the time of Akbar, the Mughal king! And sometimes, abandoned nests are used by Munias, and for the first time, I spotted a Rufous Treepie on an old nest. 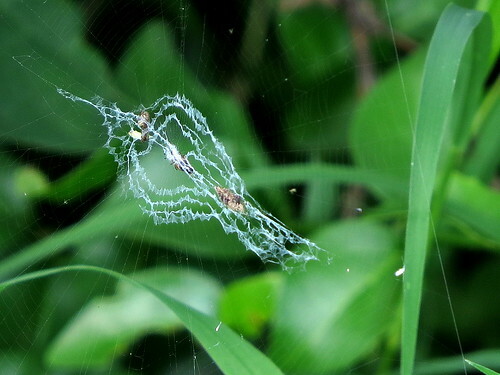 Whether it was picking insects, or trying to remove nesting material, was not clear. 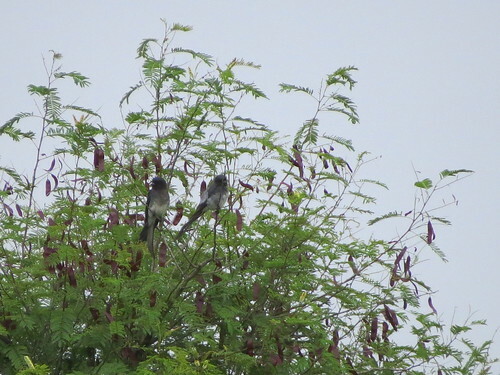 So….these birds have been around for a long time now, but each moment with them is also a delight. Here’s our group, on 17 July 2016, starting our outing, not knowing that so much of delight was in store for us! You are currently browsing the Deponti to the world blog archives for July, 2016.